Petr Sergeev Architectural Studio recently completed the offices for office interiors company Alcopa Project, located in Saint Petersburg, Russia. 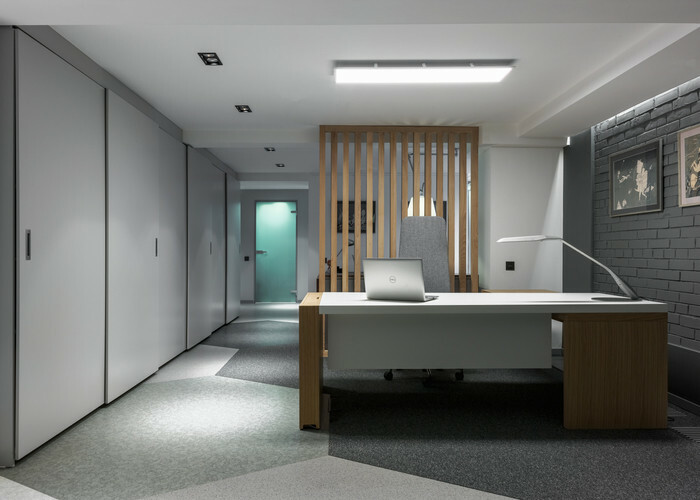 Alcopa Project designs and organizes office interiors. This is a multi-brand furniture concept that has existed since 1992. The goal of creating a united modern office space is to combine furniture solutions and audio-visual design into a single ecosystem that promotes productive performance and various activities. The main business process is a demonstration of the development opportunities for offices and public spaces in furniture area and also collaborate work. That’s why the hybrid model of the showroom and “live” office was chosen. We especially didn’t want to separate the back office from the rest space and build walls (except for the kitchen and wc-room) and even the accounting and logistics departments are placed together with everyone in the open space. We used the natural lighting of the space both from the embankment side with a beautiful view of the Bolshaya Nevka River and from the courtyard. Our meeting room is also open and separated from the business lounge by an art object – bookcase and light curtains. For internal discussions and training we use several spaces, depending on the number of people present it is possible to transform any area by using modular sofas, pouffe-tables, mobile tables and chairs, and a mobile magnetic-marker board. Each element of the showroom can be interchanged, move freely, creating negotiation zones, rest areas and work for different moods and tasks.